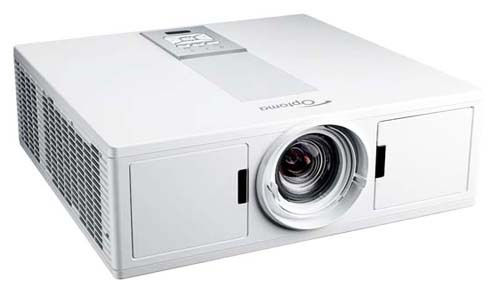 In an announcement timed with the Integrated Systems Europe trade event in Amsterdam this week, Optoma has introduced three new laser-driven DLP projectors to its ProScene ProAV line—the ZH506T, ZU506T, and ZW506-W—and began shipping another high-brighntess DLP laser model, the ZU610T . The first three models all share the same compact and surprisingly lightweight (for models in this brightness class) chassis that measures in at just 14.7 x 4.6 x 11.9 inches (WHD) and weighs just a touch over 12 pounds—making them candidates for transport to different locations if desired. They differ in resolution and light output. The ZH506T, available in black or white, is rated for 5,000 lumens and Full HD 1080p (1920x1080) resolution, while the ZU506T, also in black or white, delivers the same brightness with WUXGA resolution (1920 x 1280). The ZW506-W, in white, is a 5,200 lumen model with WXGA (1280 x 800) resolution. All the models will accept 4K UHD HDR signals and display them at the projector's native resolution. Optoma says particular attention has been paid to image quality in these models, including a color palate of up to 1.07 billion colors and tuning that facilitates accurate color reproduction. Contrast ratio is rated at 300,000:1 for all three projectors. The laser light source is rated for 20,000 hours of life. Placement and setup are facilitated in all three models with a 1.6x optical zoom lens, 15% vertical lens shift, and +/-30% horizontal and vertical, four-corner keystone correction. A 360-degree portrait mode adds extra flexibility. Control via Crestron, Extron, AMX, or Telnet are facilitated with LAN and RS-232 connections. A stereo pair of 10-watt speakers is also onboard. Street pricing is as follows: ZH506T, $2,999; ZU506T, $3,299; ZW506-W, $2,499. Also filling out Optoma's line-up is the ZU610T, a 6,000-lumen powerhouse with WUXGA resolution that's heavy on install flexibility. Its unique fixed lens offers a 1.2 to 2.13:1 throw ratio which, combined with a 1.8x digital zoom, covers a large range of throw distances without relying on costly, interchangeable lenses. Lens shift (+/-20% vertical, +/-10% horizontal) and +/-30% keystone correction are included. Integrated HDBaseT connectivity is another nice plus. As with the ProScene models, The ZU610T is said to deliver up to 1.07 billion colors and a 300,000:1 ontrast ratio. Street price is $3,499.